Want to save energy and money while keeping your home comfortable? We’ve got two simple (and relatively inexpensive) DIY projects that let you “set it and forget it” – and help you come home to comfort every day. Installing a programmable thermostat helps you save money on your energy costs by letting you regulate your home’s temperature when you are at home, asleep, and away. You just pre-program the thermostat to kick on while you’re home and turn off (or reduce the temperature) when you’re away or asleep. You may even want to consider switching to a Smart Thermostat, which can monitor your energy consumption and suggest energy-saving tips to lower your heating bills. Heating water for baths and showers, washing dishes, doing laundry and more can account for 15% of your home energy bill. 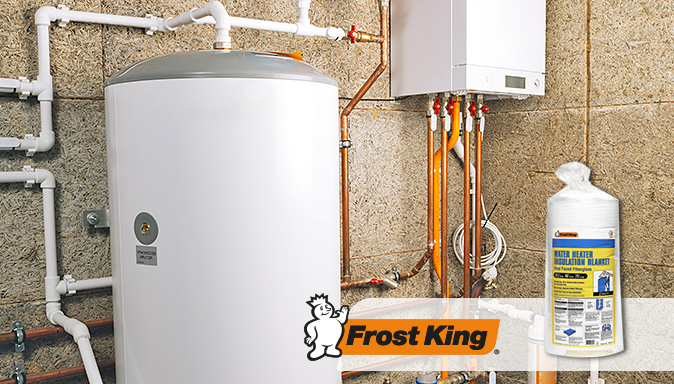 Cut these costs by setting the temperature of your hot water heater to an optimal 120°F. While you’re adjusting the thermostat, feel the outside of the tank. If it’s warm to the touch, your unit is leaking heat. Stop the heat loss by wrapping the tank in a Frost King Water Heater Insulation Blanket. For a detailed installation video, click here.